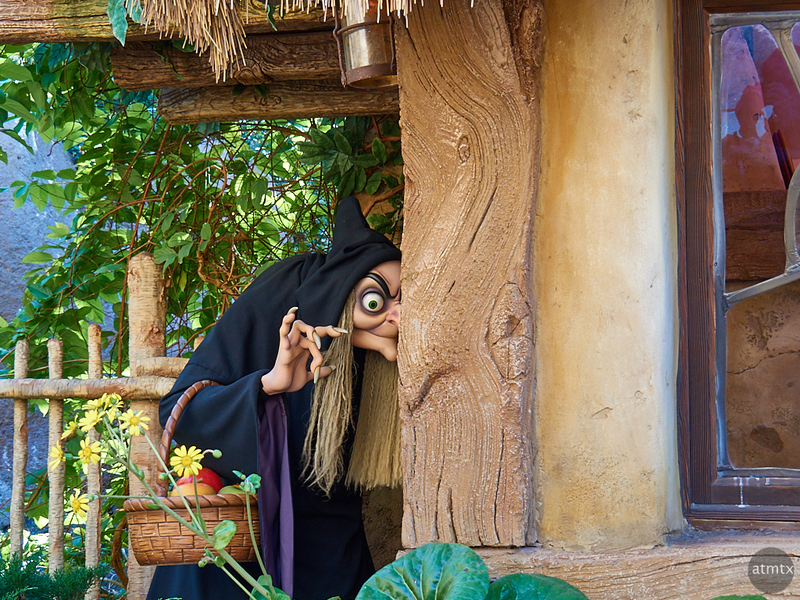 Remember the wicked witch from Snow White and the Seven Dwarfs ? Well here she is, life-size and as scary as ever. She made a surprise appearance at the end of the Seven Dwarfs Mine Train, a family friendly roller coaster at the Magic Kingdom. I’m not much of a roller coaster fan, but this one is so tame that even I didn’t break a sweat. Believe it or not, this is one of the most crowded attractions in all of Disney World. I don’t think it’s worth the two-hour wait. Luckily, we bypassed the lines by using a Fastpass. In fact, that day, we did three roller coasters in succession, all with Fastpasses. The Seven Dwarfs Mine Train, Big Thunder Mountain Railroad and Space Mountain, each more challenging than the next. My tolerance for roller coasters must be improving, since even Space Mountain, didn’t seem too bad. Part of this is due to riding the more intense rides at Universal Studios, the day before.